I play in and run tabletop RPGs. For many games, like White Wolf’s World of Darkness series, all you need for supplies is paper, pencils, and some dice. However, some games call for a more elaborate setup. 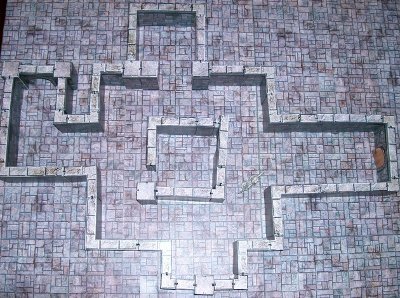 Since at least its third edition, Dungeons and Dragons, the perennial mainstay of the form, has pretty much required some sort of gridded surface and tokens for use in battle. The combat system depends on knowing how many squares (inches) away two combatants are, and many rules deal with the exact position of characters as compared to enemies and scenery. For years, I’ve used a slightly-misaligned Chessex battlemat and wet-erase markers for the surface and environment layout, with simple wooden disc-shaped tokens labeled in tape for combatants. 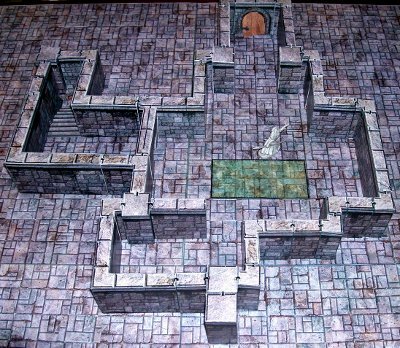 Lately, however, I’ve found myself yearning for a more visually evocative battlescape, and I think I’ve found it in the form of Fat Dragon Games’s 3D cardstock terrain. Generally, the quality is quite good. The terrain looks even better in person than it does in those pictures, and it’s quite sturdy if it’s held down with the bobby-pin system and maybe some sticky-tack for standalone pieces. 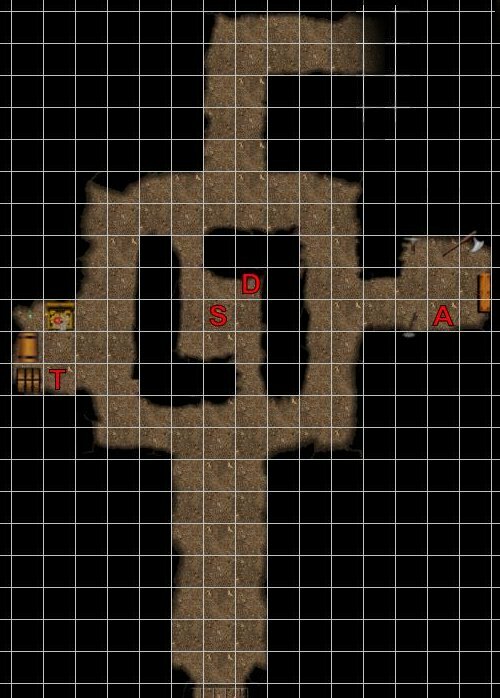 It’s scaled for standard 28-30mm miniatures; I’m planning to use cardstock miniatures, too, at least for enemies. 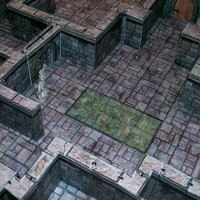 FDG has various products in addition to the dungeon set shown, including caverns, forests, cliffs, and town interiors and exteriors. I haven’t played an actual game with the terrain yet, but I’m really looking forward to it. This sort of terrain is like graphics technology in games; it’s not necessary for the experience, but it helps with visualization and immersion. There’s a real difference between playing on a flat diagram drawn with marker and actually moving little people through a three-dimensional room. The model is still abstract enough to allow for imagination, but it provides a good basis for players’ mental images. I’ve got good timing, too; there’s currently a sale going on where you get a decent discount on most of their products. And if you’re wondering, I didn’t get any compensation or anything for this blog post; I just wanted to share my excitement at my new toy. Those do look pretty cool. Is there anything special about printing to cardstock (not that I would end up using it, all my games are narrative combat)? We’ve got a color laser printer, and I can just put the cardstock in like regular paper. It’s 110lb weight, which is about as thick as an index card. It curls slightly from the rollers and I have to unbend it a bit, but other than that it prints quite nicely.